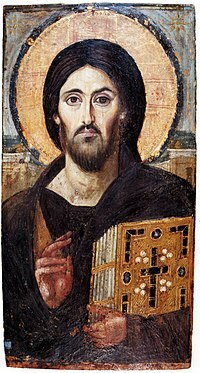 The oldest known icon of Christ Pantocrator – Saint Catherine’s Monastery. The two different facial expressions on either side emphasize Christ’s dual nature as both divine and human. St. Christopher, the giant, bore his burden with difficulty, despite the fact that he bore only the Christ child. But I was as small as a child and bore a giant, and yet my burden lifted me up. The Christ child became an easy burden for the giant Christopher, since Christ himself said, “My yoke is sweet, and my burden is light.” We should not bear Christ as he is unbearable, but we should be Christs, for then our yoke is sweet and our burden easy: This tangible and apparent world is one reality, but fantasy is the other reality: So long as we leave the God outside us apparent and tangible, he is unbearable and hopeless. But if we turn the God into fantasy, he is in us and is easy to bear. The God outside us increases the weight of everything heavy, while the God within us lightens everything heavy: Hence all Christophers have stooped backs and short breath, since the world is heavy. ~Carl Jung, Red Book, Page 283. Next Next post: Carl Jung: And the psyche is not a metaphysical concept but an empirical one.